Handmade in Japan, these Hanten are traditional Japanese workmen's coats or jackets with a simple tie loop at the front. Made with fine quality padding, this kimono-style short, slip-over coat makes an excellent, warm outdoor coat for picnics, sports events or the garden. 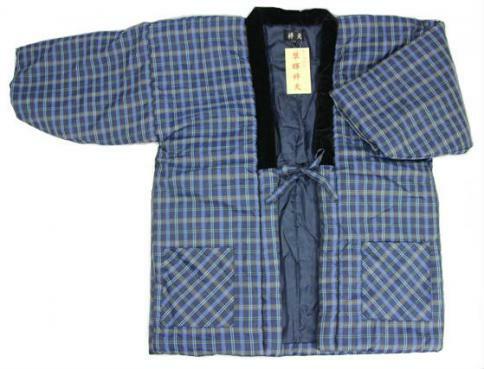 Hanten are traditional Japanese workmen's coats or jackets with a simple tie loop at the front. Handmade with fine quality padding, this kimono-style short, slip-over coat makes an excellent, warm outdoor coat for picnics, sports events or the garden. This is a loose fitting medium-to-large size, and will fit anyone between the heights of 5 feet 6 in. and 5 feet 10in. (165-175cm). The plaid pattern of the shipped item may differ slightly from that shown in the photo.